chem-bla-ics: Fwd: "We challenge you to reuse Additional Files (a.k.a. Supplementary Information)"
Fwd: "We challenge you to reuse Additional Files (a.k.a. 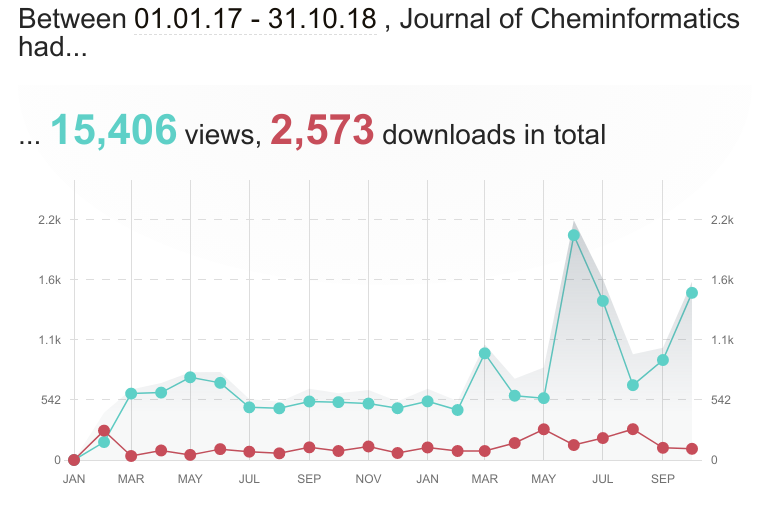 Supplementary Information)"
Download statistics of J. Cheminform. Additional Files show a clear growth. 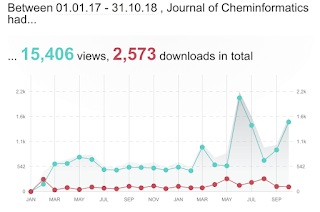 Since our open-access portfolio in BMC and SpringerOpen started collaborating with Figshare, Additional Files and Supplementary Information have been deposited in journal-specific Figshare repositories, and files available for the Journal of Cheminformatics alone have been viewed more than ten thousand times. Yet what is the best way to make the most of this data and reuse the files? Journal of Cheminformatics challenges you to think about just that with their new upcoming special issue. We already know you are downloading the data frequently and more every year, so let us know what you're doing with that data! For example, I would love to see more data from these additional files end up in databases, such as Wikidata, but any reuse in RDF form would interest me.